For other people named Francis Collins, see Francis Collins (disambiguation). Francis Sellers Collins (born April 14, 1950) is an American physician-geneticist noted for his discoveries of disease genes and his leadership of the Human Genome Project. He is director of the National Institutes of Health (NIH) in Bethesda, Maryland, USA. Collins also has written a number of books on science, medicine, and religion, including the New York Times bestseller, The Language of God: A Scientist Presents Evidence for Belief. After leaving the helm of NHGRI and before becoming director of the NIH, he founded and served as president of The BioLogos Foundation, which promotes discourse on the relationship between science and religion and advocates the perspective that belief in Christianity can be reconciled with acceptance of evolution and science, especially through the advancement of evolutionary creation. In 2009, Pope Benedict XVI appointed Collins to the Pontifical Academy of Sciences. Collins was born in Staunton, Virginia, the youngest of four sons of Fletcher Collins and Margaret James Collins. Raised on a small farm in Virginia's Shenandoah Valley, Collins was home schooled until the sixth grade. He attended Robert E. Lee High School in Staunton, Virginia. Through most of his high school and college years he aspired to be a chemist, and he had little interest in what he then considered the "messy" field of biology. What he referred to as his "formative education" was received at the University of Virginia, where he earned a Bachelor of Science degree in Chemistry in 1970. He went on to graduate as a Doctor of Philosophy in Physical Chemistry at Yale University in 1974. While at Yale, a course in biochemistry sparked his interest in the subject. After consulting with his mentor from the University of Virginia, Carl Trindle, he changed fields and enrolled in medical school at the University of North Carolina at Chapel Hill, earning an Doctor of Medicine degree there in 1977. From 1978 to 1981, Collins served a residency and chief residency in internal medicine at North Carolina Memorial Hospital in Chapel Hill. He then returned to Yale, where he was a Fellow in Human Genetics at the medical school from 1981 to 1984. At Yale, Collins worked under the direction of Sherman Weissman, and in 1984 the two published a paper, "Directional Cloning of DNA Fragments at a Large distance From an Initial Probe: a Circularization Method". The method described was named chromosome jumping, to emphasize the contrast with an older and much more time-consuming method of copying DNA fragments called chromosome walking. Collins joined the University of Michigan faculty in 1984, rising to the rank of professor in internal medicine and human genetics. His gene-hunting approach, which he named "positional cloning", developed into a powerful component of modern molecular genetics. Several scientific teams worked in the 1970s and 1980s to identify genes and their loci as a cause of cystic fibrosis. Progress was modest until 1985, when Lap-Chee Tsui and colleagues at Toronto's Hospital for Sick Children identified the locus for the gene. It was then determined that a shortcut was needed to speed the process of identification, so Tsui contacted Collins, who agreed to collaborate with the Toronto team and share his chromosome-jumping technique. The gene was identified in June 1989, and the results were published in the journal Science on Sept. 8, 1989. This identification was followed by other genetic discoveries made by Collins and a variety of collaborators. They included isolation of the genes for Huntington's disease, neurofibromatosis, multiple endocrine neoplasia type 1, inv(16) AML and Hutchinson–Gilford progeria syndrome. In 1993, National Institutes of Health Director Bernadine Healy appointed Collins to succeed James D. Watson as director of the National Center for Human Genome Research, which became National Human Genome Research Institute (NHGRI) in 1997. As director, he oversaw the International Human Genome Sequencing Consortium, which was the group that successfully carried out the Human Genome Project. In 1994, Collins founded NHGRI's Division of Intramural Research, a collection of investigator-directed laboratories that conduct genome research on the NIH campus. In June 2000, Collins was joined by President Bill Clinton and biologist Craig Venter in making the announcement of a working draft of the human genome. He stated that "It is humbling for me, and awe-inspiring to realize that we have caught the first glimpse of our own instruction book, previously known only to God." An initial analysis was published in February 2001, and scientists worked toward finishing the reference version of the human genome sequence by 2003, coinciding with the 50th anniversary of James D. Watson and Francis Crick's publication of the structure of DNA. Another major activity at NHGRI during his tenure as director was the creation of the haplotype map of the human genome. This International HapMap Project produced a catalog of human genetic variations—called single-nucleotide polymorphisms—which is now being used to discover variants correlated with disease risk. Among the labs engaged in that effort is Collins' own lab at NHGRI, which has sought to identify and understand the genetic variations that influence the risk of developing type 2 diabetes. In addition to his basic genetic research and scientific leadership, Collins is known for his close attention to ethical and legal issues in genetics. He has been a strong advocate for protecting the privacy of genetic information and has served as a national leader in securing the passage of the federal Genetic Information and Nondiscrimination Act, which prohibits gene-based discrimination in employment and health insurance. In 2013, spurred by concerns over the publication of the genome of the widely used HeLa cell line derived from the late Henrietta Lacks, Collins and other NIH leaders worked with the Lacks family to reach an agreement to protect their privacy, while giving researchers controlled access to the genomic data. Building on his own experiences as a physician volunteer in a rural missionary hospital in Nigeria, Collins is also very interested in opening avenues for genome research to benefit the health of people living in developing nations. For example, in 2010, he helped establish an initiative called Human Heredity and Health in Africa (H3Africa) to advance African capacity and expertise in genomic science. Collins announced his resignation from NHGRI on May 28, 2008, but has continued to maintain an active lab there. On July 8, 2009, President Barack Obama nominated Collins as Director of the National Institutes of Health, and the Senate unanimously confirmed him for the post. 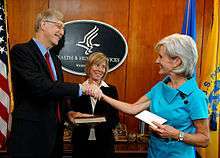 He was sworn in by Health and Human Services Secretary Kathleen Sebelius on August 7, 2009. Science writer Jocelyn Kaiser opined that Collins was "known as a skilled administrator and excellent communicator," that Obama's nomination "did not come as a big surprise" and that the appointment "ignited a volley of flattering remarks from researchers and biomedical groups." Yet, she wrote, Collins "does have his critics," some of them who were concerned with the new director's "outspoken Christian faith." Washington Post staffer David Brown wrote, however, that Collins' status as a "born-again Christian . . . may help him build bridges with those who view some gene-based research as a potential threat to religious values." Collins' appointment was welcomed by the chief executive officer of the American Association for the Advancement of Science and by Bernadine Healy, the former head of the National Institutes of Health. On Oct. 1, 2009, in the second of his four appearances on The Colbert Report, Collins discussed his leadership at the NIH and other topics such as personalized medicine and stem cell research. And, in November 2011, Collins was included on The New Republic's list of Washington's most powerful, least famous people. Collins appeared on the series finale of The Colbert Report, participating in a chorus with several other famous people singing "We'll Meet Again". Collins was instrumental in establishing the National Center for Advancing Translational Sciences (NCATS) on Dec. 23, 2011. Other projects included increased support for Alzheimer's disease research, which was announced by Secretary Sebelius and Collins in May 2012; the Brain Research through Advancing Innovative Neurotechnologies (BRAIN) Initiative, announced by President Obama and Collins on April 2, 2013, at the White House, and, in February 2014, the Accelerating Medicines Partnership (AMP), a public-private partnership between NIH, the U.S. Food and Drug Administration, 10 biopharmaceutical firms, and multiple non-profit organizations. In January 2015, President Obama announced the NIH-led Precision Medicine Initiative (PMI) in his State of the Union address. Through advances in research, technology, and policies that empower patients, PMI will enable a new era of precision medicine long envisioned by Collins and many others in which researchers, providers, and patients work together to develop more individualized care. In fiscal year 2016, the first funding for the initiative was awarded, with $130 million allocated to NIH to build a national, large-scale research participant group, called a cohort, and $70 million allocated to NIH's National Cancer Institute as part of PMI for Oncology. The PMI Cohort Program will seek to extend precision medicine to all diseases by building a national research cohort of 1 million or more U.S. participants. In January 2016, in his State of the Union address, President Obama called for a new initiative, to be led by Vice President Joe Biden, to galvanize the nation's research efforts against cancer. Fueled by an additional $680 million in the proposed fiscal year 2017 budget for NIH, the National Cancer Moonshot Initiative will aim to accelerate progress toward the next generation of interventions to reduce cancer incidence and improve patient outcomes. In other precedent-setting actions during his time as NIH Director, Collins in June 2013 outlined plans to substantially reduce the use of chimpanzees in NIH-funded biomedical research. In November 2015, he announced NIH will no longer support any biomedical research involving chimpanzees. In January 2013, Collins also created two senior scientific positions as part of the NIH's response to an advisory group's recommendations on Big Data and the diversity of the scientific workforce. In December 2013, Collins announced the selection of Philip E. Bourne as NIH's first Associate Director for Data Science, and, in response to internal NIH working group recommendations, Collins appointed Stanford cardiologist Hannah Valantine in 2014 as the institution's first Chief Officer for Scientific Workforce Diversity. In December 2015, Collins and other NIH leaders released a detailed plan that charted a course for NIH's efforts over the ensuing five years The NIH-Wide Strategic Plan, Fiscal Years 2016-2020: Turning Discovery Into Health was aimed at ensuring the agency remains well positioned to capitalize on new opportunities for scientific exploration an to address new challenges for human health. Mention of Collins' love of guitar playing and motorcycle riding can often be found in articles about him. While directing NHGRI, he formed a rock band with other NIH scientists. Sometimes the band, called "The Directors," dueled with a rock band from Johns Hopkins University, led by cancer researcher Bert Vogelstein. Lyrics of The Directors' songs included spoofs of rock and gospel classics re-written to address the challenges of contemporary biomedical research. Collins has performed at TEDMED 2012, StandUpToCancer, and Rock Stars of Science. While leading the National Human Genome Research Institute, Collins was elected to the Institute of Medicine and the National Academy of Sciences. He was a Kilby International Awards recipient in 1993, and he received the Biotechnology Heritage Award with J. Craig Venter in 2001. He received the William Allan Award from the American Society of Human Genetics in 2005. In 2007, he was presented with the Presidential Medal of Freedom. In 2008, he was awarded the Inamori Ethics Prize and National Medal of Science. In the same year, Collins won the Trotter Prize where he delivered a lecture called "The Language of God". Collins and Venter shared the "Biography of the Year" title from A&E Network in 2000. In 2005, Collins and Venter were honored as two of "America's Best Leaders" by U.S. News & World Report and the Harvard University Center for Public Leadership. Collins received the Albany Medical Center Prize in 2010 and the Pro Bono Humanum Award of the Galien Foundation in 2012. Collins was a keynote speaker at the Congress of Future Medical Leaders in 2014. By graduate school Collins considered himself an atheist. However, dealing with dying patients led him to question his religious views, and he investigated various faiths. He familiarized himself with the evidence for and against God in cosmology, and used Mere Christianity by C. S. Lewis as a foundation to re-examine his religious view. He eventually came to a conclusion, and became a Christian during a hike on a fall afternoon. He has described himself as a "serious Christian". In his 2006 book The Language of God: A Scientist Presents Evidence for Belief, Collins wrote that scientific discoveries were an "opportunity to worship" and that he rejected both Young Earth creationism and intelligent design. His own belief, he wrote, was theistic evolution or evolutionary creation, which he preferred to call BioLogos. He wrote that one can "think of DNA as an instructional script, a software program, sitting in the nucleus of the cell". He appeared in December 2006 on The Colbert Report television show and in a March 2007 Fresh Air radio interview to discuss this book. In an interview with D. J. Grothe on the Point of Inquiry podcast he said that the overall aim of the book was to show that "one can be intellectually in a rigorous position and argue that science and faith can be compatible", and that he was prompted to write the book because "most people are seeking a possible harmony between these worldviews [science and faith], and it seems rather sad that we hear so little about this possibility. Collins is a critic of intelligent design, and for this reason he was not asked to participate in the 2008 documentary Expelled: No Intelligence Allowed. Walt Ruloff, a producer for the film, claimed that by rejecting intelligent design, Collins was "toeing the party line", a claim which Collins called "just ludicrous". In an interview he stated that "intelligent design is headed for collapse in the not too distant future" and that "science class ought to be about science, and opening the door to religious perspectives in that setting is a big mistake." In 2007, Collins founded the BioLogos Foundation to "contribute to the public voice that represents the harmony of science and faith". He served as the foundation's president until he was confirmed as director of the NIH. Collins has also spoken at the Veritas Forum on the relationship between science and religion and the existence of God. Christopher Hitchens referred to Francis Collins as a 'Great American' and stated that Collins was one of the most devout believers he had ever met. He further stated that Collins was sequencing the genome of the cancer that would ultimately claim Hitchen's life, and that their friendship despite their differing opinion on religion was an example of the greatest armed truce in modern times. earnest agnostics who have considered the evidence and still don't find an answer. I was reacting to the agnosticism I see in the scientific community, which has not been arrived at by a careful examination of the evidence. I went through a phase when I was a casual agnostic, and I am perhaps too quick to assume that others have no more depth than I did. In a 1998 interview with Scientific American, Collins stated that he is "intensely uncomfortable with abortion as a solution to anything" and does not "perceive a precise moment at which life begins other than the moment of conception". However, in the same interview it was clarified that Collins also "does not advocate changing the law". ↑ Smith, Kerri; Baker, Noah (2016). "Back to the thesis: Late nights, typos, self-doubt and despair. Francis Collins, Sara Seager and Uta Frith dust off their theses, and reflect on what the PhD was like for them.". Nature. 535 (7610): 22–25. doi:10.1038/535022a. ↑ "About The BioLogos Foundation". The Biologos Foundation. Retrieved 3 May 2014. We embrace the historical Christian faith, upholding the authority and inspiration of the Bible. We affirm evolutionary creation, recognizing God as Creator of all life over billions of years. We seek truth, ever learning as we study the natural world and the Bible. ↑ Francis S. Collins; Sherman M. Weissman (Nov 1984). "Directional cloning of DNA fragments at a large distance from an initial probe: a circularization method" (PDF). Proc. Natl. Acad. Sci. USA. Retrieved 2011-09-29. ↑ Leon. E. Rosenberg (2006). "Introductory Speech for Francis S. Collins". Retrieved 2011-09-29. ↑ "Positional cloning of human disease genes: a reversal of scientific priorities" (PDF). University of Alberta, Department of Biological Science. Retrieved 16 October 2011. ↑ Collins F (1992). "Positional Cloning: Let's not call it reverse anymore". Nature Genetics. 1 (1): 3–6. doi:10.1038/ng0492-3. ↑ Nelson, David L. (Jun 1995). "Positional cloning reaches maturity". Curr Opin Genet Dev. 5 (3): 298–303. doi:10.1016/0959-437X(95)80042-5. PMID 7549422. Retrieved Aug 25, 2014. ↑ Tsui, LC; Buchwald M; Barker D (29 November 1985). "Cystic fibrosis locus defined by a genetically linked polymorphic DNA marker". Science. 230 (4729): 1054–1057. Bibcode:1985Sci...230.1054T. doi:10.1126/science.2997931. ↑ Pines, Maya (2008). "Blazing a Genetic Trail/.../Jumping Toward the Gene". Howard Hughes Medical Institute. Retrieved 16 October 2011. ↑ Pines, Maya (2008). "Stalking a Lethal Gene:Discovering the Gene for Cystic Fibrosis". Howard Hughes Medical Institute. Retrieved 16 October 2011. ↑ Marx, J. (1989). "The cystic fibrosis gene is found". Science. 245 (4921): 923–5. Bibcode:1989Sci...245..923M. doi:10.1126/science.2772644. PMID 2772644. ↑ MacDonald, M (1993). "A novel gene containing a trinucleotide repeat that is expanded and unstable on Huntington's disease chromosomes". Cell. 72 (6): 971–83. doi:10.1016/0092-8674(93)90585-E. PMID 8458085. ↑ Rubin, Raphael; Strayer, David S. (2008). Rubin's Pathology: Clinicopathologic Foundation of Medicine (5th ed.). Baltimore: Wolters Kluwer Health: Lippincot Williams & Wilkins. pp. 201–3. ISBN 978-0-7817-9516-6. ↑ Fauci; et al. Harrison's Principles of Internal Medicine (Small textbook) (16th ed.). p. 2453. ↑ Chandrasekharappa, S. C.; Guru, S. C.; Manickam, P; Olufemi, S. E.; Collins, F. S.; Emmert-Buck, M. R.; Debelenko, L. V.; Zhuang, Z; Lubensky, I. A.; Liotta, L. A.; Crabtree, J. S.; Wang, Y; Roe, B. A.; Weisemann, J; Boguski, M. S.; Agarwal, S. K.; Kester, M. B.; Kim, Y. S.; Heppner, C; Dong, Q; Spiegel, A. M.; Burns, A. L.; Marx, S. J. (1997). "Positional Cloning of the Gene for Multiple Endocrine Neoplasia-Type 1". Science. 276 (5311): 404–7. doi:10.1126/science.276.5311.404. PMID 9103196. ↑ Eriksson, Maria; Brown, W. Ted; Gordon, Leslie B.; Glynn, Michael W.; Singer, Joel; Scott, Laura; Erdos, Michael R.; Robbins, Christiane M.; Moses, Tracy Y.; Berglund, Peter; Dutra, Amalia; Pak, Evgenia; Durkin, Sandra; Csoka, Antonei B.; Boehnke, Michael; Glover, Thomas W.; Collins, Francis S. (2003). "Recurrent de novo point mutations in lamin a cause Hutchinson–Gilford progeria syndrome". Nature. 423 (6937): 293–8. Bibcode:2003Natur.423..293E. doi:10.1038/nature01629. PMID 12714972. ↑ National Human Genome Research Institute (ed.). "The Division of Intramural Research". Retrieved 16 October 2011. ↑ Jamie Shreeve, "The Blueprint of Life," U.S. News and World Report, 10/31/05, URL accessed 30 January 2007. ↑ Simon, Stephanie. "Faithful to God, Science". Los Angeles Times. Retrieved 3 May 2014. "It is humbling for me, and awe-inspiring," he said, standing at Clinton's side, "to realize that we have caught the first glimpse of our own instruction book, previously known only to God." That moment moved Collins -- who is married and has two grown daughters — to talk more publicly about his faith and to write the book. "It's been a bit like taking a public bath," he said. ↑ "President Clinton, British Prime Minister Tony Blair Deliver Remarks on Human Genome Milestone". CNN. 26 June 2000. Retrieved 3 May 2014. 1 2 "Transcript, Bob Abernethy's interview with Dr. Francis Collins, director of the Human Genome Project at the National Institutes of Health.". PBS, Religion and Ethics Newsweekly. Retrieved 16 October 2011. ↑ "Scientist at work: Francis S. Collins; unlocking the secrets of the Genome". The New York Times. Nov 1993. ↑ Chemical & Engineering News, Vol. 86 No. 31, Aug. 04, 2008, p. 33, "Francis Collins leaves NIH"
↑ Kaiser, J. (2009). 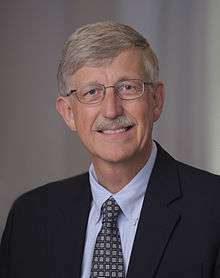 "White House Taps Former Genome Chief Francis Collins as NIH Director". Science. 325 (5938): 250–1. doi:10.1126/science.325_250a. PMID 19608881. 1 2 "Obama picks Francis Collins as new NIH Director". Washington Post. July 8, 2009. Retrieved 16 October 2011. ↑ Harris, Gardiner (October 6, 2009). "For N.I.H. Chief, Issues of Identity and Culture". The New York Times. Retrieved May 2, 2010. ↑ The Editors (2011-11-03). "Washington's Most Powerful, Least Famous People". The New Republic. Retrieved 2011-10-25. ↑ "Francis Collins". The Colbert Report. 2009-10-01. Retrieved 2009-10-18. ↑ "FACT SHEET: President Obama's Precision Medicine Initiative". whitehouse.gov. 2015-01-30. Retrieved 2016-04-29. ↑ "NIH framework points the way forward for building national, large-scale research cohort, a key component of the President's Precision Medicine Initiative". National Institutes of Health (NIH). 2015-09-21. Retrieved 2016-04-29. ↑ "FACT SHEET: Investing in the National Cancer Moonshot". whitehouse.gov. 2016-02-01. Retrieved 2016-04-29. ↑ "Blue Ribbon Panel Announced to Help Guide Vice President Biden's National Cancer Moonshot Initiative". National Institutes of Health (NIH). 2016-04-04. Retrieved 2016-04-29. ↑ "NIH Will No Longer Support Biomedical Research on Chimpanzees". National Institutes of Health (NIH). 2015-11-18. Retrieved 2016-04-29. ↑ "NIH Names Dr. Philip E. Bourne First Associate Director for Data Science". National Institutes of Health (NIH). 2015-08-10. Retrieved 2016-04-29. ↑ "Hannah Valantine, M.D., named NIH's first Chief Officer for Scientific Workforce Diversity". News & Events. National Institutes of Health. 20 January 2014. Retrieved 8 March 2015. ↑ "NIH-Wide Strategic Plan". National Institutes of Health (NIH). 2015-10-06. Retrieved 2016-04-29. "Science Writers Entertained By High-Powered Battle Of The Bands". The NIH Catalyst. Celia Hooper. Jan/Feb 1998. ↑ Kaplan, Karen (Sep 18, 2010). "To scientists, he's the real rock star". Los Angeles Times. ↑ "Montgomery County, Maryland, Press Releases," December 19, 2000, URL accessed 30 January 2007. ↑ "U.S. News & World Report," 2005, URL accessed 4 February 2008. ↑ Collins, Francis (4 September 2008). The Language of God: A Scientist Presents Evidence for Belief. Simon and Schuster. ISBN 9781847396150. ↑ "Francis Collins". The Colbert Report. 2006-12-06. Retrieved 2009-10-18. ↑ "Francis Collins on 'The Language of God'". Fresh Air. 2007-03-29. 1 2 D.J. Grothe (2007-08-31). "Dr. Francis Collins - The Language of God". Point of Inquiry. Retrieved 2015-09-03. ↑ Dean, Cornelia (September 27, 2007). "Scientists Feel Miscast in Film on Life's Origin". The New York Times. Retrieved May 2, 2010. ↑ Beardsley T (1995). "Profile: Where Science and Religion Meet". Scientific American. 278 (2): 28–29. Wikimedia Commons has media related to Francis Collins.